Scalp Micropigmentation, is the most advanced non-invasive hair loss solution on the market today. It has been a life changing treatment for many of our male and female clients suffering from hair loss or experiencing thinning. Regardless of whether the loss is associated with illness, genetics or aging SMP will work for you. The use of carefully matched pigment creates the appearance of realistic hair follicles that can restore a more youthful look to any hairline. It is also possible to create the appearance of greater density for thinning or fine hair. How do your practitioners create “follicles” that look realistic? We use a fine tattoo needle that was developed specifically for the optimal deposit of pigment in the correct layer of scalp skin. In order to accomplish that well however, a thorough analysis and artistic approach is necessary. We take the time to precisely assess your natural hair patterns and then mimic those patterns using shades of pigment that create a 3D end result. It is often not enough to just add follicles to areas where hair has thinned or is no longer present. It can make the SMP look obvious and unnatural. 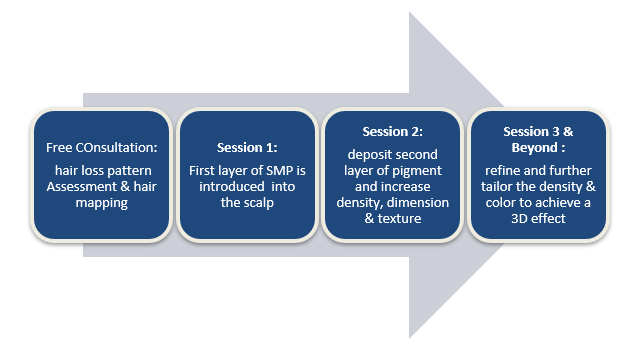 Instead we will expertly blend the new SMP “hair” into existing hair and increase density over a series of sessions to achieve a natural, long lasting result that is as unique as you. I’ve had hair transplants in the past. Can SMP provide a solution to hide the scars? Absolutely! Scalp Micropigmentation is an excellent solution for blending FUT strip scars, FUE scars, scarring due to scalp reduction and scarring from old hair replacement treatment modalities. In a few hours you will walk out the door with results that are immediate, natural looking and long lasting. It’s a simple way to build confidence over night. What is the Scalp Micropigmentation process like? During your free consultation, we will develop a custom SMP solution by using our hair mapping protocol to give you the results you desire. We will discuss your pattern and the time necessary to deliver a 3D result. We can provide consultations in-person, over the phone, or by using video chat applications. Emailing us your photos for a preliminary assessment is also an option especially if you are not located close to the NYC area! Your first treatment will serve to lay a foundation of follicles on which we will build over the course of 2-4 sessions spaced over time. Depending on the extent of your hair loss, this can take anywhere from 30 minutes to 4 hours per session to complete. After this treatment, most clients experience some residual redness. The redness typically subsides within 24 hours. The second treatment is scheduled approximately 2 weeks after the first treatment. We assess pigment retention and color and further optimize your custom color plan. It is here that we begin to create more density, blending and dimension by using multiple shades of pigment. This session is where the results really take shape! Additional sessions will ensure that the corrective mapping is completed entirely and yields the most natural look possible! What does SMP as a hair loss solution cost? Pricing is as unique as your hair loss pattern! Smaller corrective procedures may cost less where as more significant hair loss correction will cost more and take more sessions over time. What are some of the typical factors that impact the price and time necessary? The size of the treatment area. This is how we determine how many follicles we need to simulate to achieve the desired end result. On average, each square inch of your scalp contains approximately 2200 hair follicles. The more density you have naturally, the more follicles we must simulate in the areas that have experienced loss to make them look as natural as possible. If you’re bald, consider that we are now restoring every square inch entirely as opposed to filling in! The natural density of your hair. If you have more follicles than average per square inch, we need to have additional sessions to create the right amount of density for you. Density is built over time never in one session. In this case, we must also do more work to blend hair seamlessly into the neighboring hair follicles. Your skin: Dryness, thickness, presence of scars and overall sensitivity of your skin impact the time per session and the overall number of sessions needed to achieve the best result. The presence of scar tissue: If there is significant scarring of the skin, we may need to consider reducing the scar tissue prior to depositing pigment into the skin. Compromised skin can have a significant impact on the precision of your results so we must work slowly and carefully to ensure that we maintain tissue integrity. There is also a significant amount of blending necessary to properly camouflage scars and a greater number of sessions and time will be necessary. On average, our clients tend to spend in the range of $1800-$3300. Some will pay more and others less depending on the factors we detailed above. To accurately determine the pricing that will address your specific hair restoration needs, an in person consultation is necessary. If you would like an estimated quote and to see if you qualify for financing, send us some photos and a short description of your desired results. We will respond to your inquiry within 24 hours and help you decide if SMP is the right hair loss solution for you! Reach out and book your FREE consultation today!